Give a personalized Gund baby gift to welcome that new baby. 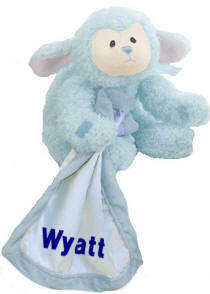 Baby will love the soft and silky satin and super soft plush which is a signature of all Gund plush. These excellent quality baby Gund gift items may be personalized with baby's name, for a truly wonderful personalized baby gift. All our personalized baby gifts are shipped in 1-2 business days.